Haribo mega roulette gummi candy is back. Each gummi candy roll comes with 18 real fruit flavored candies and is approximately 5 inches long. 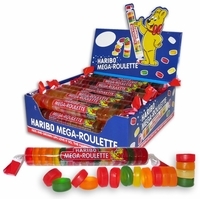 Mega roulette candy has been gone for around 2 years, we are so happy they are finally available again. These are one of those classic gummi candies that were gone, but not forgotten. Made in Germany by Haribo candy company, one of the most famous makers of gummies. 24 / 1.5 oz rolls per box.